Since we have been talking about in-store events that have been happening at Circle Sky Records, it's probably long overdue that I tell you about the store itself! Doyle Tatum owns the store and Donnie Thompson is an employee at the store. Also, Richard Golden helps out when he can. Besides having a cool selection, Circle Sky is a great place to hang out and shoot-the-breeze with Doyle and Donnie. Whenever I need my music-speak fix, I'll swing by the store and have fascinating chats, whether it is rock 'n roll trivia or new/old releases. I haven't found a store this user-friendly since my days in Texas (Sundance Records BEFORE they got new owners and became 'corporate'). Doyle started opened up Circle Sky Records about 15 months ago, when he got laid off from his 17 year long computer job at Geac, Inc. About the same time Donnie got laid off from his job, inventory control at a manufacturing plant. Doyle explains, "I had always had the dream of opening my own record store when I retired. The computer job market was at it's low, so I talked to Donnie and decided to give it an early go!" I was curious as to why the store was named "Circle Sky"? Doyle replies, "We are huge Monkee's fans, so why not name the store after a song from the movie, HEAD. Donnie listed a bunch of Monkees-related store name possibilities on the phone one evening and when he said 'Circle Sky' I knew we had the name!" One of the things I really like about Circle Sky are their in-store appearances. I've seen some really good local bands that I wouldn't have known about, since I don't always make it to the clubs in downtown Atlanta. I asked Doyle how they pick the acts to play in his store. "We don't have a set schedule, just check our website," Doyle says. 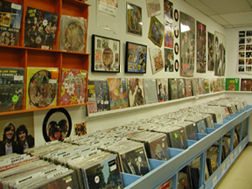 "The in-stores come about through word of mouth amongst the local pop musician's community. We are planning future CD release parties at the store." Circle Sky also puts out their own fanzine called Melody Hill (we have featured a few of the articles in EAR CANDY). Doyle explains, "Donnie had the idea of doing a Pop fanzine called Melody Hill (named after the flipside of the Archies' single "Sugar, Sugar") before the store existed. Once the store was open, the need for the magazine arose and provided a nice vehicle for advertising Circle Sky. We wanted to create something beyond an ordinary flyer, something that people would want to keep and look forward to receiving." In these days of the Internet culture, even small record stores have websites and Circle Sky is no exception. Their website includes upcoming events, select articles from Melody Hill, photo galleries from in-store appearances (even audio and soon- video clips), lot's of links for locals artists, and coming soon a shopping cart system. People can also email Circle Sky to order any items that are listed on the site. And of course they can special order discs or records - just give them a want list and they'll do the best they can. So, if you are in the Atlanta area and looking for that hard to find disc, want to see some cool bands live (for free) or just want to talk with knowledgeable people about rock 'n roll - definitely give Circle Sky a visit!